Phoenix just can't catch a break these days. One event after another just keep happening that puts my city in a bad light. Last year we had that woman that died at Sky Harbor Airport under police custody. A protester (black dude!!) decided it was fun to shake things up and carry an rifle outside the building the President was giving a speech at. This rifle carrying protester is a member of a church whose pastor publicy expresses his pure hatred for our President. The resulting incident led Arthur Frommer to encourage the masses to avoid visiting the Phoenix area all together. Of course our Mayor and CVB was not happy to hear that. We got folks just walking into our airport all willy nilly and stealing thousands of luggage in the span of a year! This is reason number 3,957,209 why I carry on my luggage. 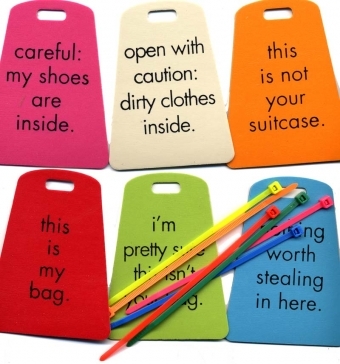 * Attached brightly colored ribbons or luggage tags to identify your suitcase from a distance. * Invest in high quality, brightly colored, boldly designed luggage. * Purchase a luggage hugger. * Label your luggage. Sky Harbor just added patrols to the baggage claim area who will inspect bags upon exiting the airport. My girlfriend gifted me these labels. I get lots of comments. * Place something smelly in your suitcase like rotten cheese or a really dirty sock. The smell can convince the kleptos to stay away.